I think about this a lot: when will the Habs be a true contender? Not just a good team, a playoff team that might get hot and go on a miracle run, but a top-5 threat to win the Cup. 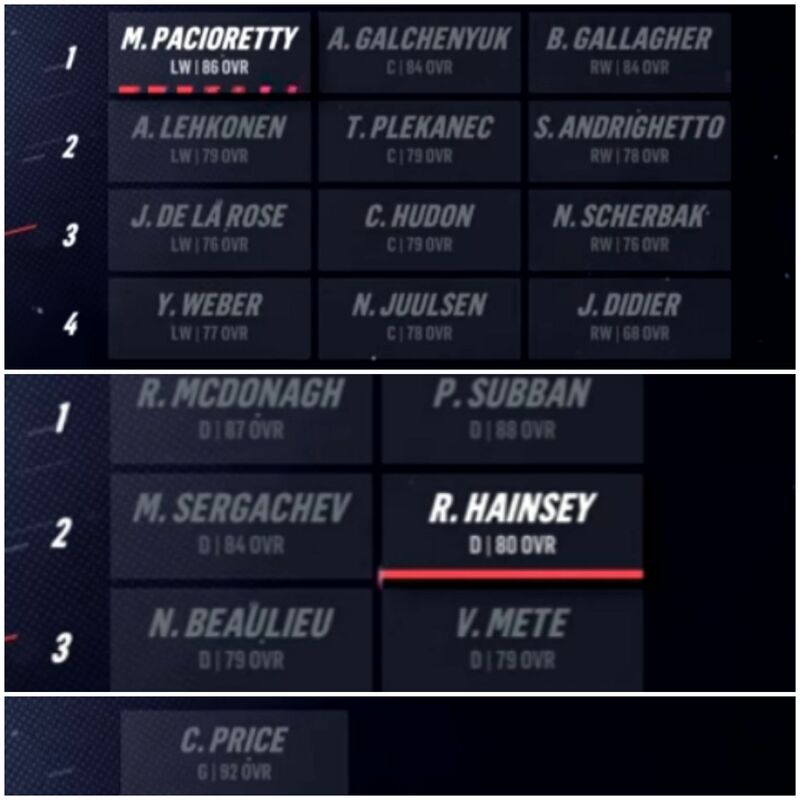 I've got a bit of time off from work and thought I'd play the game of trying to project the Habs' lineup in three years. This seems a reasonable time-frame. 2021-22 will represent Bergevin's 9th year as GM and the fourth year of the current 'retooling' job. I note ages and hopefully realistic extrapolations over point totals in cases where this seems useful. My questions are twofold: first, is this a reasonable extrapolation of the roster in three years? And second, does this look like a real contender? General observations: the Habs have quite a few C in the system, almost too many. Some of these will probably be moved to the wing. The other is that the D still projects to be a tire-fire IMHO, especially with Weber's likely decline from first-pairing D-man (which we have already seen serious signs of over the past weeks). Finally, if Drouin's fairly flat development arc continues, this team will have issues all the way down the left side of the lineup. CUKE'S PROVISIONAL VERDICT: good team, probably not a real contender. Bergevin is gonna need either some shrewd and high-impact UFA signings, or else about two more home-run trades of the Galchenyuk/Patches variety, in order to make it happen. Brook - 30 points? Perhaps a 2nd-pairing guy? I've thought about this too and I find it hard to really say. I think this off season and next season are crucial to determining what kind of team the Habs are going to be. What direction will Bergevin choose to go? Will he continue to retool and make shrewd moves, or will he try to speed things up and take big gambles? Good asset management is going to be key in the next year. Bergevin is going to have to figure out which vets are going to still be useful in a few years and which ones should be traded now while they still have value (some are at their peak value). He's also going to have to figure out which young players/prospects/picks are expendable to try and make improvements to the team. If there's one thing I've come to learn about Bergevin (or maybe more the organization), is that you never know what to expect. The unexpected fight for a playoff spot this year might have them raising the bar next year. Sometimes teams raise the bar too high and go all in because they think that they are better than what they really are. If your projected lineup is correct, I would have to say no. We are not contenders with that lineup. Probably a playoff team, but that's about it. Just my two cents. This is not a reasonable extrapolation as it assumes that no free agents will be added with the cap space we have plus what will be gained if you assume Tatar, Petry and others are no longer around. That talent is assumed to just disappear, not traded for anything and not replaced by free agents. What are odds they will entice a NCAA free agent or two to sign on? Obviously thinking just of Poehling's d-captain. Schuldt is someone they'll take a run at and I'm sure they'll be after some others as well. I'm not sure any NCAA FA should be pencilled into a three-years-from-now lineup though. They're not going to be trading high-impact guys on expiring contracts. They are a bubble team and therefore will be fighting to make the playoffs, which means they'll keep such players for stretch drives. And anyhow, even if they did trade 'em, the pucks/prospects returned for those good-not-great players would be unlikely to help us by 2021-22. So a pessimistic but not unrealistic reading is to say the Habs do not currently have the organizational pieces to be serious contenders in three years. They're going to be relying on UFA home runs and/or home runs at the trade table to pull that off. My point is that if you took any roster in the NHL and assumed that all the players who will become UFA will leave, with no replacements added... you wouldnt have many cup contending rosters. Thats why this is an unrealistic way to consider building a team. Instead id look at things this way. 1) will they have a number 1 goalie? Yes i think price will still be that caliber and even past 3 years as he declines, Primeau looks like a hell of a prospect. 2) what will the centre depth be? Kk is no guarantee but is a good bet to be the number 1 c. Further down the depth chart... domi, danault, poehling, suzuki should combine to fill spots 2 and 3. 3) wing scoring.... if suzuki is not a centre... he fits here. Gallagher js young enough to still be good. Drouin will still be here based on contract. Tatar is young enough he could be effective if re-signed. Will one of ylonen, ikonen, or the later picks become a top 6 winger? 4) defence. Shea Weber is likely still an elite shooter but may not be a true number 1 at that point. He should still be at least a #3. Mete should be a top 4 dman. Brook, romanov, juulsen, fleury all have the chance of developing into top 4 guys. However brook and romanov are the only two who have any chance of being top pair defencemen and there is no guarantee. So what will the habs have to do. 1) hope that 2 of 3, (kk, brook, romanov) become 1st line/1st pair type of players. 2) acquire a top pair dman somehow. Bergevin pulled this off before in Petry. (He also acquired Weber but that also saw hin trade a top pair d). So he found a top pairing guy and will likely need to do so at some point. 3) get good depth with other acquisitions or development of prospects. 1 and 3 seem possible. 2 is the hardest area to address clearly. That's where I'm at, and why I thought this should be a tanking season before we outperformed our talent level and made it a playoff race. However, if our prospects hit your point projections then we'll be in good shape. If Kotkaniemi, Suzuki, Brook, and Poehling are producing at that level in 3 years it would represent this generation of prospects panning out in a big way. The most likely long term prognosis for this squad is another era in the middle class of the league. Only a few teams get to be contenders and we have two juggernauts in the division, with Buffalo possessing a strong foundation as well. We'll have to be the plucky underdogs for a while yet, barring a major injection of talent. My prospect projections were based on some reading - I'm no prospect expert - but I was shooting for 'reasonable optimism' on that front. I do have a really good gut feeling about Suzuki. Even so, there are no high-end stars in my lineup above. Only a 34-year old Price and a declining Weber. As Commandant notes, turning that into an elite team is not impossible. But a lot of things will have to to go just right for that to happen, including a #1LD UFA signing here (unlesd we can somehow trade for one). This is not an organization that you look at and go, 'phew, in a few years they are going to be scary.' The likeliest scenario is yet another era of being good, not great. I watched a video on YouTube where a guy adjusted every NHL team to reflect if every draft pick went back to their respected teams. The results were interesting, as you can see the composition of the rosters. Boston would be a powerhouse, Nashville would have the best defense of all time likely, for example. I didnt verify anything here and I dont know why he has Juulsen and Weber up front, likely most prolific to choose from. So either Montreal needs to draft and develop better at forward, or MB has been making great trades and signings, or both. It’s crazy to think that your “three years out” roster actually has more returning players than if you look at our roster of 2015-2016 (3 years ago). Gallagher, Petry, Byron, Price, Lindgren, Hudon. I guess you can count Weise, too. included ONE free agent signing for next year and its a big one! I don’t believe Poehling projects as a #1 C, does he? Also Karlsson and Weber are both RD. YES a right handed defensemen that can actually QB the PP and set up the weber one timer effectively. Probably a top point producer on top of it! should be nice, amazing actually! we'd have a top D unit for sure as long as Mete continues the way he has and Romanov and Brook progress. Juulsen's vision/health is a concern but i continue to be optimistic. Also with Petry coming up to UFA status after year 3 Erik Karlsoon would be an absolute dream! i wasn't necessarily anointing Poehling as the 1C as much as assembling lines I thought would work best together. Hopefully Kotkamania runs wild on the NHL as early as next season! With that said, projections are just projections... and in hockey drafting and scouting they are wrong way more than they are right. Poehling has continued to impress and improve game over game... i wouldn't be foolish and put a ceiling on this kid and whether he's a 1/2 or 3. I'm 100%sure he wont be a scorer like McDavid or Mckinnon but could he be a Bergeron? of course! and that would turn out to be a great pick. Sooner or later this team (MTL) has to start hitting home runs on there 1st rounders!